Detroit has long been pressed for full-line grocery stores that rival the suburbs’, so the concept of a gourmet market seemed like a reach. But appearances can be deceiving. 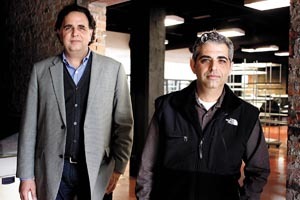 Peter and Michael Solaka, whose father and uncle were harbingers of the gourmet-market craze in the 1970s and 1980s with a store in Detroit’s Lafayette Park, are returning to their roots. In May, the brothers are reopening Ye Olde Butcher Shoppe, only this time it will be along Woodward Avenue in historic Brush Park, just a few blocks north of Comerica Park. “Oh, we’ve heard the naysayers who say a gourmet market won’t work in Detroit, but no one who’s tried it has the experience we do,” says Peter, a 20-year veteran of the telecommunications industry who returned to the food business two years ago with the opening of the Gourmet Deli in the 500 Tower of the Renaissance Center. The brothers, who both worked at the Lafayette Park store and recall loyal customers Diana Ross, Duke Fakir, and Coleman Young, are eager to return to their former trade. In addition to lowering expectations of high prices, the Solakas are inheriting a reputation for limited selections from a previous owner. To be sure, during a visit to the 8,000-square-foot location last August, Peter and Michael already had contractors installing refrigerators, convection ovens, and shelving for hundreds of items, including separate meat, fish, poultry, seafood, and deli counters. In a throwback to the old days, butchers will be on hand to cut a two-inch-thick rib-eye steak or prepare salmon filets for grilling at home. Naturally, there will be a fresh produce section, hundreds of bottles of wine ranging in price from $7 to $30, a coffee stand, prepared foods, indoor and outdoor cafes, a bakery station featuring regular and specialty breads, a salad bar, as well as basic staples like paper towels, cleaning products, and pet food. Imported and domestic beers, including many from Michigan, will be available. Open daily, the store will offer a range of seafood on Sunday mornings, including lox, sable, whitefish, and chubs.